Afterwards I went back to sakis and we went out to near Kawanishi station for some lunch. We went to this Korean restraunt. Since I have been travelling there are two new places I really would like to visit. Iran and Korea. The food was great I had something that had cheese rice prawns cheese mussels and cheese, it was awsome. I thought I'd pay for the meal to say thank you to sakis mum. But she didn't let me. It was riddiculas, She would never let me pay the whole time I was with them. I never knew how to show how much I appriciated how much she did for me. Washing my cloths, cooking breakfast, etc. After the restraunt I went with saki to Kawanishi station. 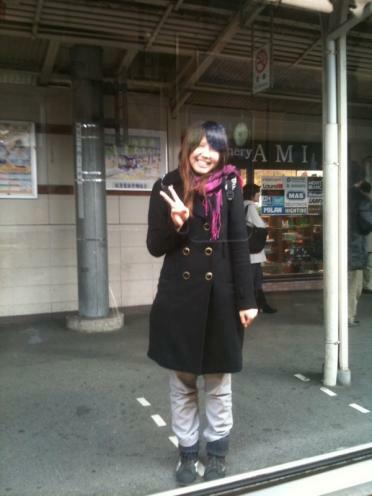 She only had to go a couple of stops but I was going to umeda. We were going on the same line tho. I said good bye to saki In the train. This photo is the last I saw of her.